Equities are likely to trade higher on Wednesday as investors wait for the release of Federal Reserve minutes from last month's meeting later today and keep an eye on upcoming meetings of European leaders on the Greek issue. ­Russian stocks jumped Tuesday supported by energy and resources shares. The MICEX added 1.8% and the RTS climbed 2.8%. 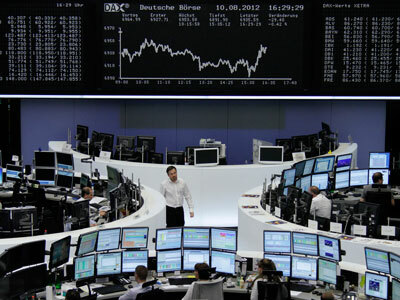 European shares climbed Tuesday amid reports that the European Central Bank is examining plans to cap bond yields. Besides that, Joerg Asmussen, a German member of the central bank’s executive board, voiced support for the bond purchases. The Stoxx Europe 600 rose 0.4%. The Italian FTSE MIB rose 2.4% and the Spanish IBEX 35 added 1%. US stocks turned lower Tuesday as Apple’s drop overshadowed optimism that Europe would soon take steps to curb its debt crisis. Apple’s shares fell as the company failed to settle a potentially costly patent dispute with Samsung. 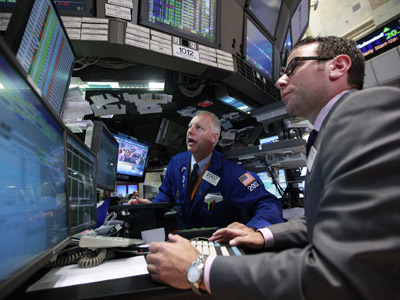 The Dow Jones lost 0.5%, the S&P 500 slid 0.4% and the Nasdaq Composite fell 0.3%. Asian stocks headed south Wednesday, weighed down by earnings reports and weak Japanese trade figures. Japan’s Nikkei traded down 0.3%, South Korea’s Kospi lost 0.7%, and Australia’s S&P/ASX 200 declined 0.15%. In China, Hong Kong’s Hang Seng fell 0.8%, while the Shanghai Composite shed 0.4%.